Bangkok has quite the reputation among the traveling crowd . Some say that it is loud, dirty (physically and morally), and that your best bet is to get out quickly and move to the beaches or go play with tigers in the northern mountains. Others (albeit the minority) say that it is a crazy place that must be experienced once and that it has redeeming qualities like all large cities. After spending just over 24 hours in the original “City of Angels” with my travel partners Kiera and Erin, I am emphatically in the minority and would even venture to say that I loved the place. Yes, traffic is terrible, there is a seedy underbelly unrivaled even by Amsterdam’s red light district, and the garbage man must make his rounds once a month (max! ), but upon closer inspection there are kind-hearted honest people, deep traditions that pulse throughout daily life, and deals to be had on nearly every corner. While trying to organize this post I bulleted out all of the experiences from our one full-day in BKK. I have a short attention span when it comes to blogs about “what I did today” so here are a few highlights that you may find amusing or helpful if planning a future trip to Bang Makok (seriously, that was its original name—I’m still giggling). Rabies Vaccination – Kiera and I will be volunteering at a spay and neuter clinic on an island where rabies is still present. 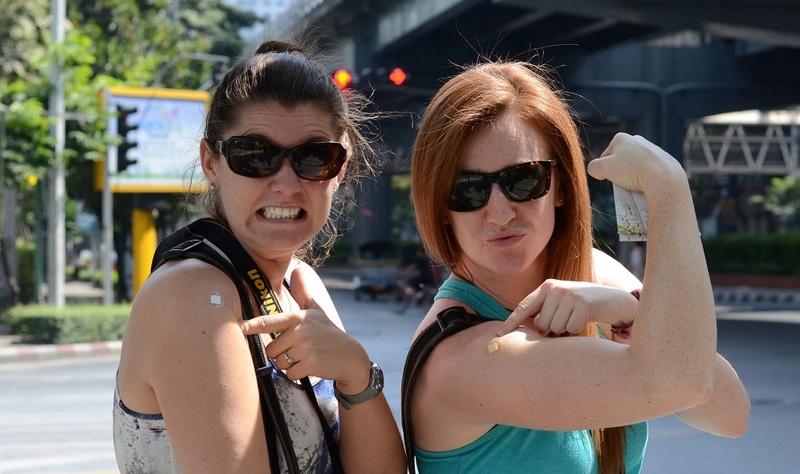 We decided to get our first shot at the Red Cross in Bangkok for $15 instead of the $250 charged throughout the US. In the end, we’ll be set back $45 versus $750… which is outrageous. We also decided to throw in Japanese Encephalitis for good measure. Most girls just can’t resist a killer sale. Erawan Shrine – When we stumbled upon the Hindu shrine in the center of Siam Square we became snap-happy tourists looking to capture the experience. 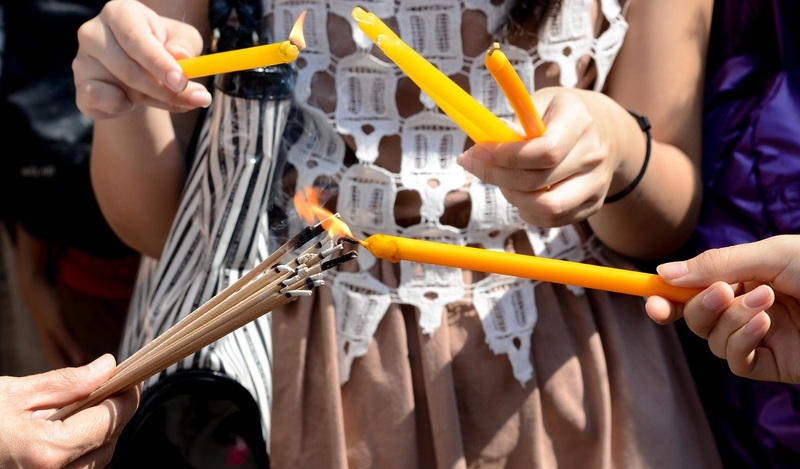 Yellow carnations were strewn about, incense filled the air, and Thai performers sang to Brahma in hopes that their prayers would be answered. I cluelessly ran around shooting everything I could until I bent down while looking through my viewfinder and accidentally placed my face directly into the wave of smoke created by hundreds of sticks of incense. Suddenly my eyes looked and felt like I had seen The Notebook for the first time on the same day that my favorite pet passed away. Time to go. 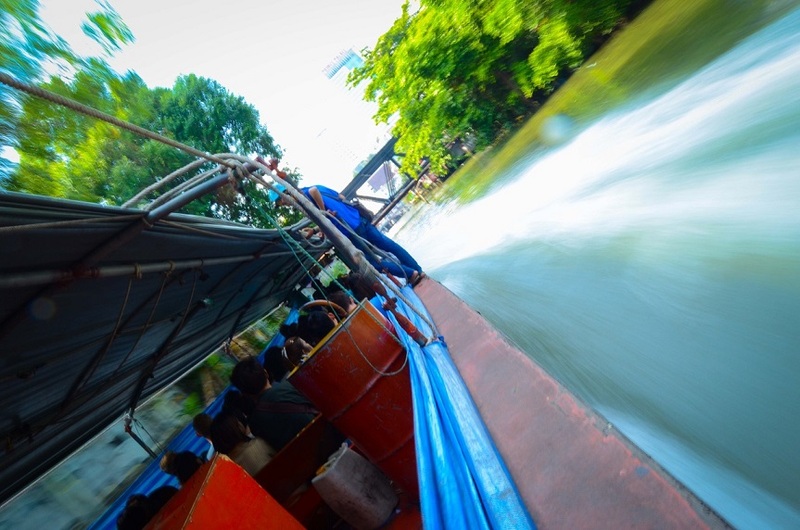 Public Ferry Boat – In an effort to experience “true Bangkok” and save $1 each, we waited along a canal whose water could only be described as mud soup with floating garbage bags, kiddie pools, and other trash acting as croutons. I half expected a dead body to float by as we waited. Not a joke. The ride itself was certainly one to remember as it was nearly identical to the Jungle Cruise at Disneyland. Except with this version the “guide” yells at you to pay him the equivalent of $0.50 for the honor of potentially propelling off the side of the boat into a waterway that will surely cause you to grow a third eye. California New Year’s Eve – We arrived in Bangkok on New Year’s Eve after 22 hours of travel. Needless to say, we were exhausted, and despite our best efforts we didn’t make it to the ball drop at midnight. We did, however, commit to celebrating NYE along with our fellow San Franciscans at 3PM the next day. 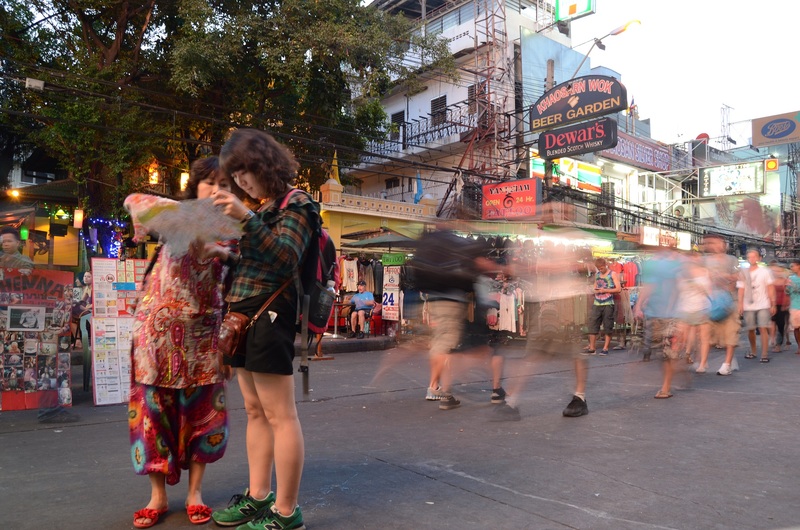 With just two minutes to spare, we secured prime people spotting real estate at a restaurant on Khao San Road and were staring straight into the spout of a three liter Chang beer tower. Kiera and Erin have a warped sense of “fun” so they decided to eat a scorpion from a street vendor in celebration. I had pad thai—hold the arthropod. Cat Lovefest – No great day on the road is complete without potentially contracting a rare skin disease from the local feral dog and cat population. Surely I’m not the only one who feels this way. The Bangkok cats came out of the woodwork as soon as the sun went down and while we batted .000 when it came to getting within scratching distance, we sure had a great time running around like idiots. Per usual. Other happenings that didn’t get a shout-out above included a breakfast of red curry with pork and ramen noodles, a triple-shampoo/conditioning and full blow-out for a whopping $6, shopping Khao San road and debating the cultural significance of a t-shirt with a girl snorting a line of cocaine in the shape of the word “Facebook,” and an hour-long leg and foot massage for just over $5. Boom. It was an exhausting and exhilarating day, and I wish we could do it again. We have now moved on to the Andaman Coast where I am doing my best to hide from the sun. So far so good and you better believe that you’ll be the first to know if, while sunbathing, Erin lives up to her Irish name— Erin Go Braghless. 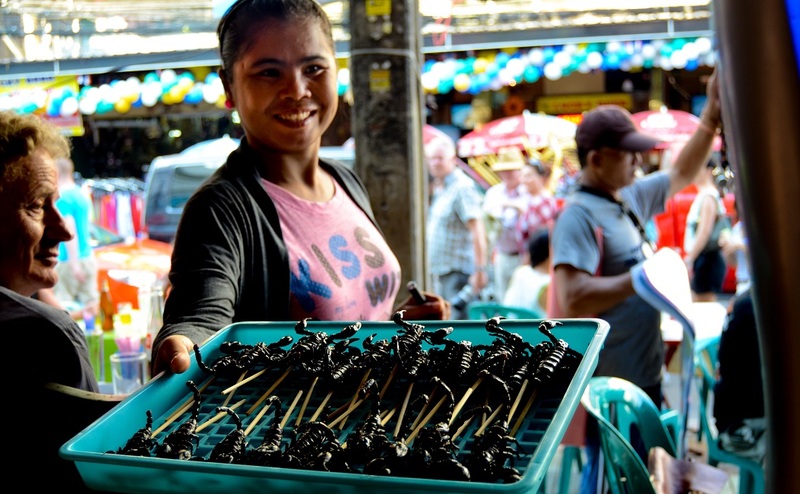 Did Kiera really eat a scorpion on a stick? Wow – Yuck – Wow!